Years ago a dear friend of mine gave me her family recipe. She told me that when she was young growing up on a farm in Potter Co. Pennsylvania they often had to cut corners. Though they had chickens,there were times when they did not lay their eggs, or they needed them to sell. Her mom would make this chocolate cake as a special treat. Later in life one of her children had egg allergies as does my little granddaughter. This recipe is just wonderful...and you can not tell it is void of eggs. So moist and the texture is wonderful. So much better than the standard box mixes...and the thing is you know what is in it! 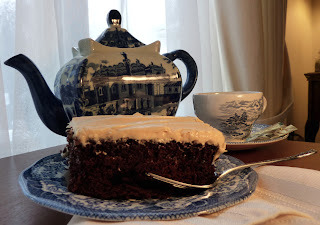 I love topping it off with my Peanut butter frosting...or you can use something simple like a can of cherry pie filling...but it is so moist you really don't need anything!